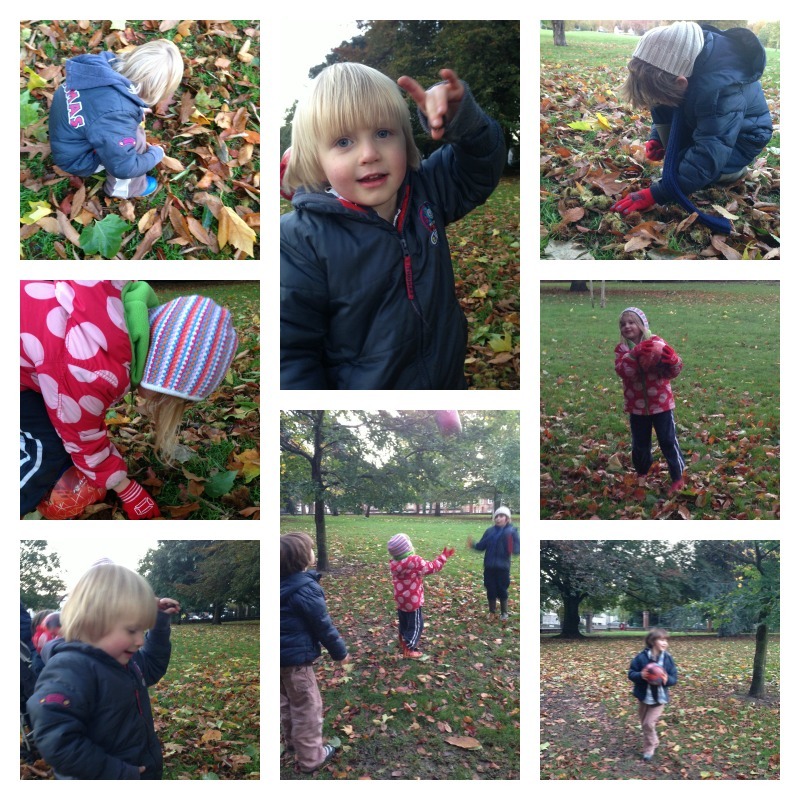 On Tuesday afternoon, we went to our local park to hunt for some more chestnuts. 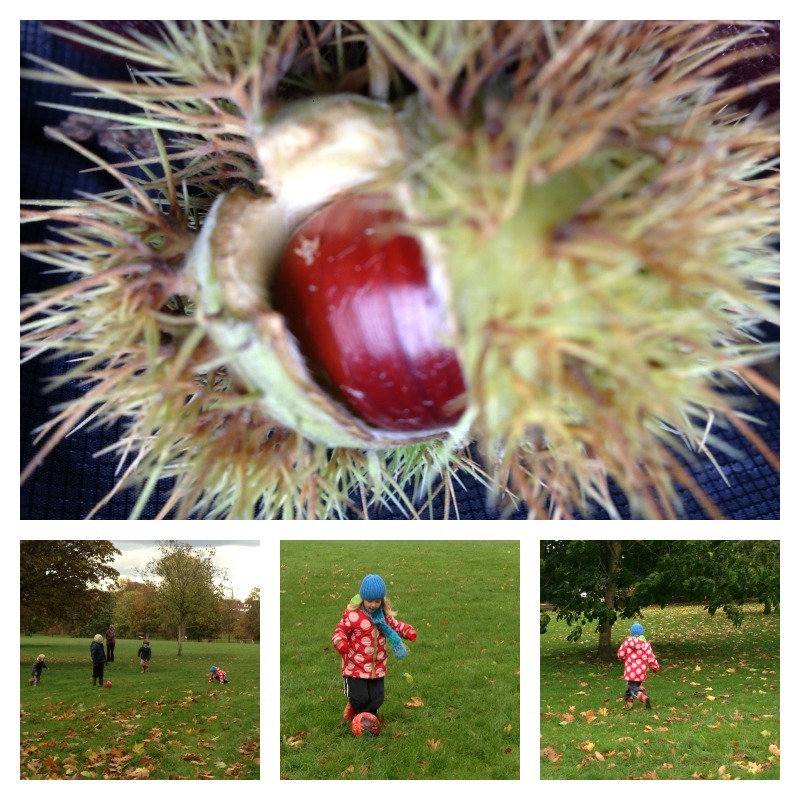 My mum was with us, so between us we managed to gather quite a few chestnuts fairly quickly, with a little help from the children before they decided to play football instead. 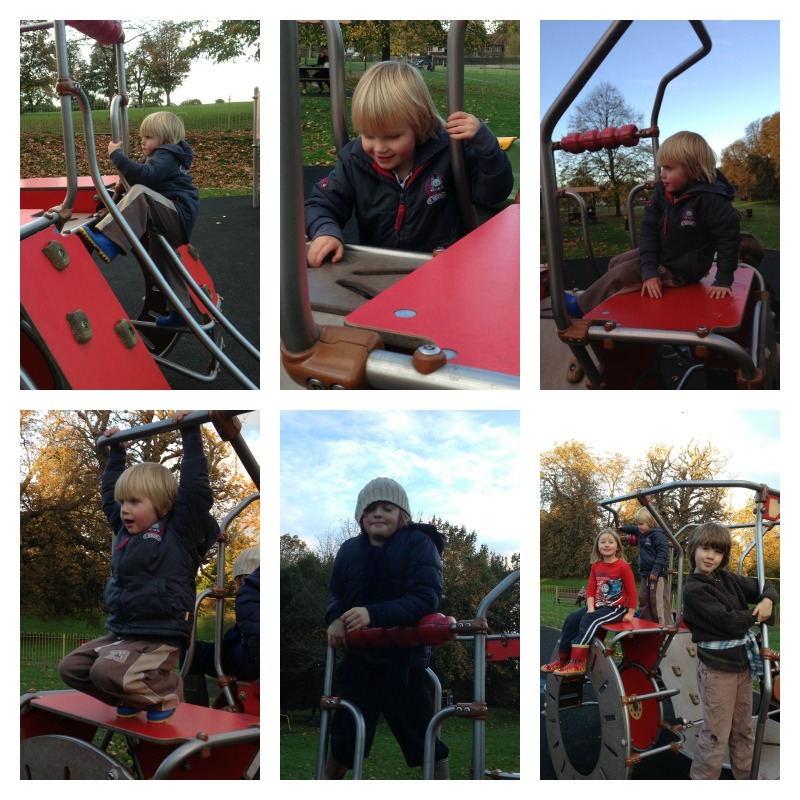 Next we went down to the play area and the children had a good time, but after a while it was getting too cold and we decided to set off home. We picked up a few more chestnuts on the way back and then the big three played piggy in the middle for a while. 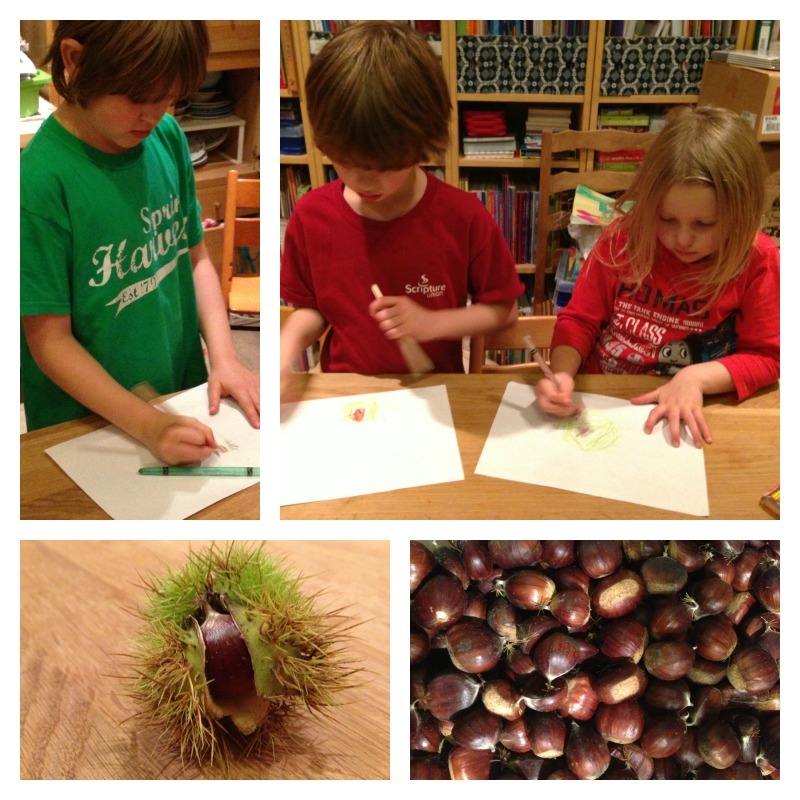 Back at home, they drew some pictures of a chestnut in its spiky case. On Wednesday, we went to Home Education Group at our friends’ house. 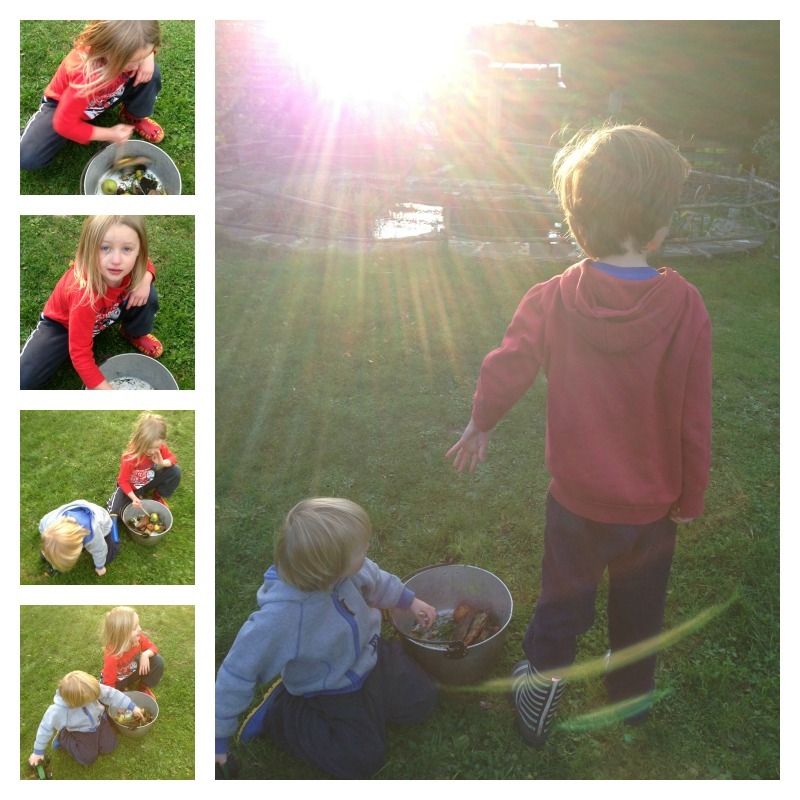 Owl wasn’t feeling very well, so he spent most of the afternoon inside with one of his friends playing with Lego, but the rest of the children went outside to find ingredients to make a magic potion. They also had fun in the new tree house which has been built since we last visited. I had offered to make a kite with anyone who was interested (after reading Fiona’s post last week) and suddenly, at the end of the afternoon, some of the children decided they would like to do it. So we found two straight, lightweight sticks and tied them in a cross shape with string. Then we taped on a plastic carrier bag. 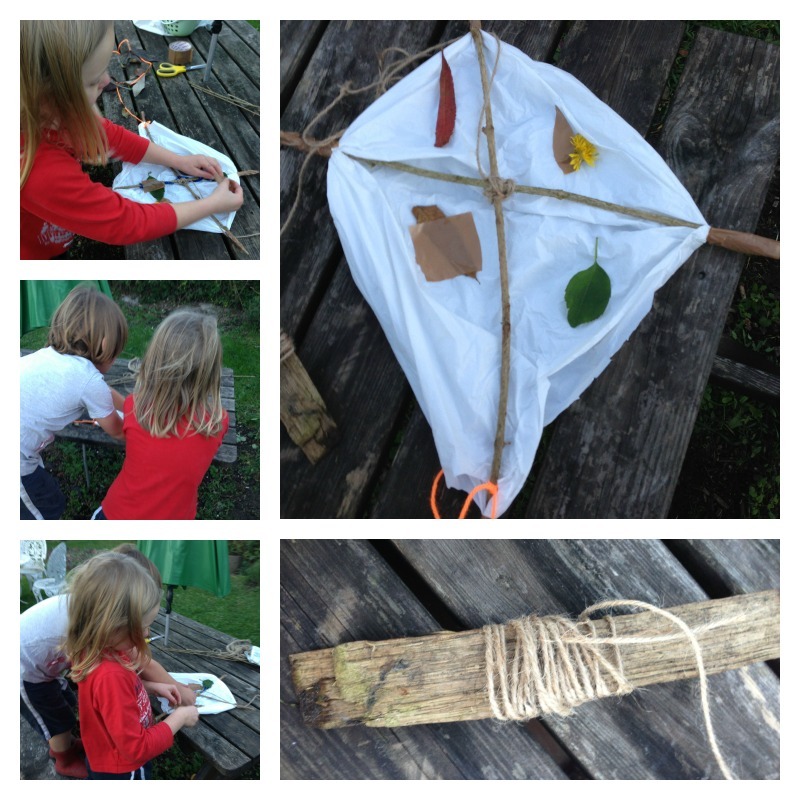 We decorated the kite with leaves, added a wool tail with more leaves, and found a piece of wood to wind the string around. 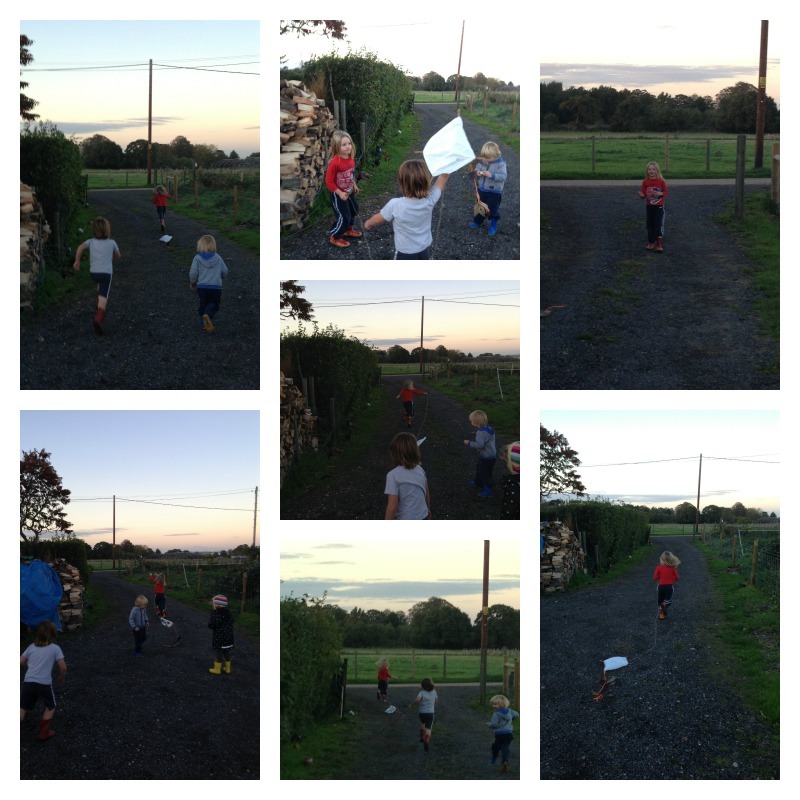 The children had a lot of fun testing out their kite. It didn’t seem to matter to them that it didn’t fly terribly well – they managed to get it up off the ground just enough to satisfy themselves that it was flying! They had some real success a couple of times, only to disappear around the corner before I could get a photograph. Finally it was time to go home. There was just time for Rabbit to admire her potion one last time. She and Tiddler also went to say goodbye to the chickens, and I quickly made another kite for the boy of the house, so we could take the first one home. I took a picture of their carved pumpkin for inspiration too! It was a lovely afternoon with good friends and I left feeling really positive. 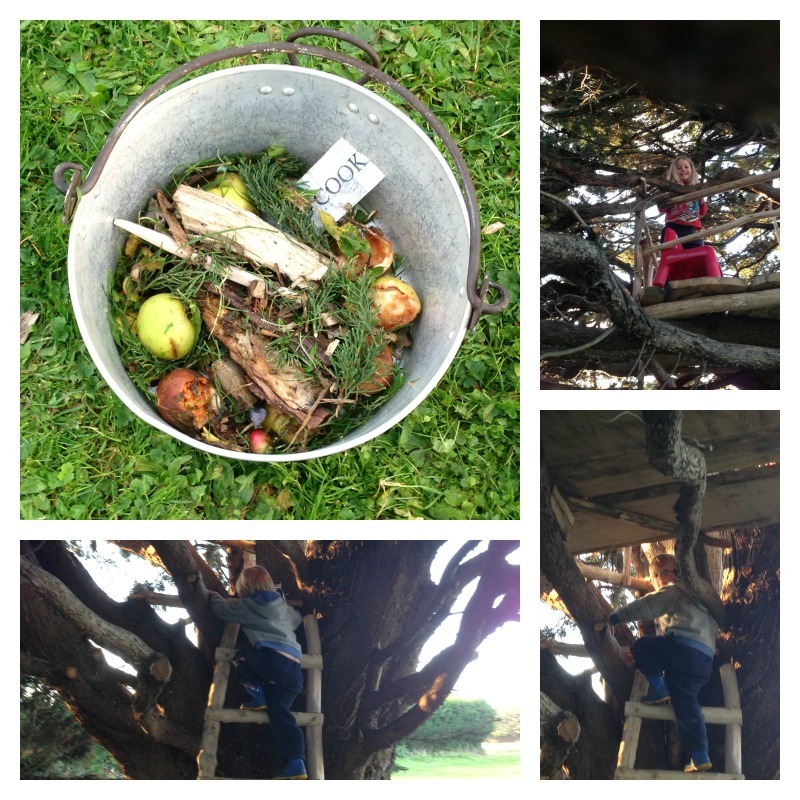 This entry was posted in Natural Childhood and tagged chestnuts, country kids, kites, potions on November 2, 2013 by Hannah. Loads of activities packed in their! That kite looks a really nice idea, and love the potion! I love the magic potion! Sounds like a great day. 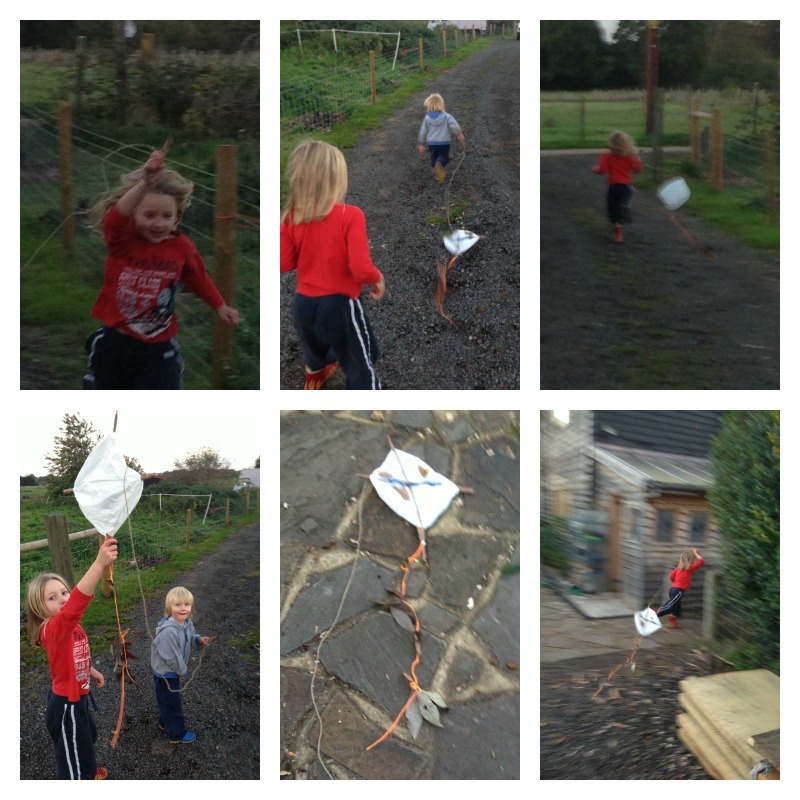 I’ve been wanting to make the same kite with my kids since reading the Coombe Mill (Fiona’s) post too. 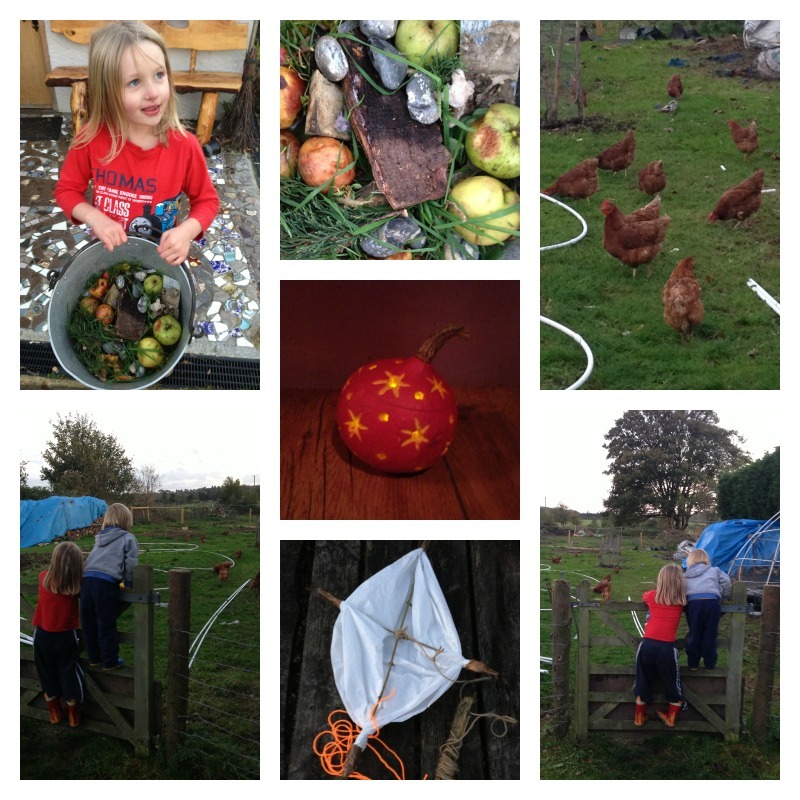 We had a big potion post for Halloween made from finding on the farm (all in my Monday post). I’m so pleased that you tried out my homemade kite, they are not the best at flying but so easy and fun to make and they do fly a little. 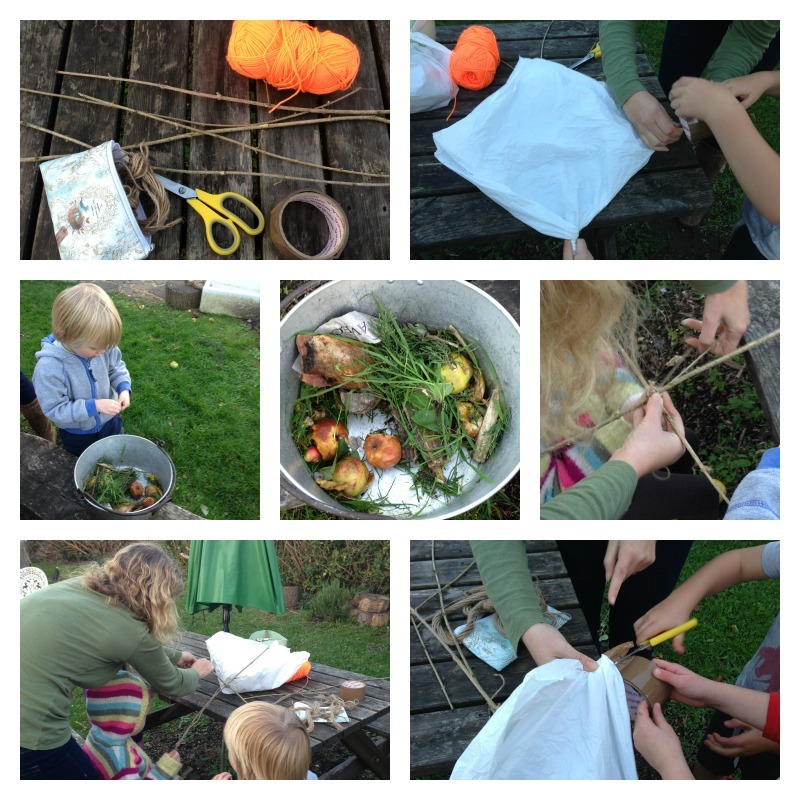 Meeting up with others and enjoying outdoor ideas together is a lovely way to share ideas, even better when you can pass them on again through Country Kids, thank you! What a shame Owl wasn’t feeling well and missed the potions- it was always “perfume” me and my sister used to make by crushing flowers. You made a great kite there too!